Published in Rafu Shimpo, January 23, 1959. 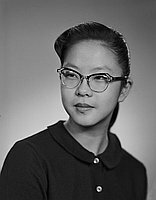 Studio head and shoulder portrait of Gloria Kanemura, student body president of John Adams Junior High School in Los Angeles, California, January 20, 1959. Thirteen year old girl in dark blouse with buttons and eyeglasses turns slightly to the right as she looks to the left of viewer. Typed on original negative envelope: Kanemura, Miss Gloria -- Student Boy Press at John Adams High.